“I come, at the entrance to the path of the Holy Novitiate, to say a word on behalf of Our Lord. The Lord in His love and His mercy has given us His grace, His love and His blessings. What did we do in our turn? Lift our eyes to the heavens and bless such a good Father! The Lord's power broke forth over the earth, the riches of His love are given to us, what have we to do? Give a generous thanksgiving to Our Lord, to show Him our gratitude for all His kindness. What is the love of Jesus? This is nothing else but a tenderness mixed with kindness, He gives it to us at every moment to strengthen our souls and our courage. What does He receive, this God of Love for the love He gives? He receives the most abuse, the most profanities! O blind of this time, what then when the light strikes your eye to make you see the divine effects that God works in all places by His infinite power? Tremble, small number of friends of God, for the fate of so many unfortunate souls who have rejected the light to live in the idolatry of the evil spirit. Tremble, groan and cry, because the devastation is at its height. Our sweet Lord in His great goodness and His love so powerful and all adorable, allows to act in full freedom the free will of all His enemies. He will detract nothing from them, He will grant them a power so strong, that, by this same power, they should sense that the powerful Hand of the Lord has reserved for them a frightening blow. (I.e. the evil ones will be granted a long period of time on earth and left to their own devices without any apparent punishment from God, it should make them realise that the longer they are left alone, the greater the punishment that lies in store for them.) But they only think about their work, to deepen their work in evil. By the power of digging, (i.e. down deeper in evil) they will arrive at the end of this profound career, and there, what do they have once it is done? They will have nothing! (i.e. all their work to undermine God will be for nothing.) God has spoken, God has commanded, God will put an end to their scandal. There, there walk a great number of the children of God! Today God makes and will allow (them) to be made martyrs. Here is how God Himself allows it to be so: He makes Himself suffer and He orders still others after Him to suffer. The passage of time is simply a time of suffering and pain. It is necessary that we meet God through the sufferings and pains. Our Lord asks souls to share His shame. (I.e. His humiliations). Children of God, the storm is brewing everywhere, evil and injustice will soon enter in triumph. (I.e the long period of time and power that would be granted to the evil ones). “Pope Leo XIII, just after celebrating Mass, turned pale and collapsed as though dead. Those standing nearby rushed to his side. They found him alive but the pontiff looked frightened. He then recounted having a vision of Satan approaching the throne of God, boasting that he could destroy the Church. According to Pope Leo XIII the Lord reminded him that his Church was imperishable. Satan then replied, “Grant me one century and more power of those who will serve me, and I will destroy it.” Our Lord granted him 100 years. The Lord then revealed the events of the 20th century to Leo XIII. He saw wars, immorality, genocide and apostasy on a large scale. Immediately following this disturbing vision, he sat down and wrote the prayer to St. Michael. For decades it was prayed at Mass until the 1960’s. Like many of the Church’s spiritual defences, it was discontinued in the second half of the 20th century.” Source: Joe Tremblay, “The 100 Years Test” CNA, February 1, 2013. “Who will bear the terrible revenge? (I.e. who will suffer the terrible vengeance of the evil ones and the storm they are brewing). Towards the Temple of God, towards those who represent God on earth, towards those who serve and are, with all their will, ready to serve and to suffer for His glory. Under the fury of the storm, (I.e. persecutions from the evil men) what will you do? Wait, pray and do what God wants. Love God with all our heart, faithfully serve God, serve him through the obscurities that are in us, serve despite the darkness where God leaves us and where we need to walk, serve Him all the same. (I.e. during the 'dark night of the soul' when it seems God has abandoned us and we are dry in spirit, we are to remain faithful.) Even when the light of your soul is absolutely extinguished, do not lose heart, go through all the dangers, face the dangers and God will fill you with His grace and His comfort. Who can make us happy on earth, except the peace of God that lives within us, working in us, that prays in us? Without this peace, man becomes like one damned, he runs and precipitates himself into the first gulf that he meets, because it is the devastation inflicted within him by his unregulated passions. Yet this is what happens in many hearts. To keep peace, there is one thing to do, it is to say what God wants, it is to obey the Will of God, it is nothing that can be found in the human creature. It is to be found in God, since He is the treasure of all. Serve God, love God, seek God and run away from this love of the world, since it is through the Cross that we come to happiness and richness. We take our crosses, carry them without a blush, since it is the Cross that will one day give us the happiness of seeing God, to understand and to love. Carry the cross. There are crosses everywhere! The joy of loving the Cross gives us in this life, a delicious hope to see and possess God. What does God love more than His Cross? Nothing. It was His portion, it was His Throne of pain. He chose it because He wanted all His children to be made heirs of His Cross, His treasury. That is why we are called children of the Cross, the heirs of God. 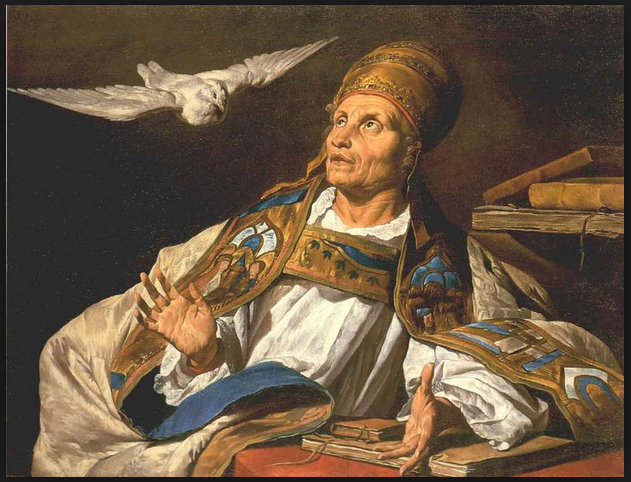 Notes: St. Gregory the Great (c.540-604 AD), Doctor of the Church, has been aptly described as Vir incomparabilis, an incomparable man. Bone in Rome of patrician parents, (his mother was St. Sylvia), he became a praetor or prefect, mayor of the city, before he was thirty, but he soon gave up the office, turned his ancestral home on the Caelian Hill into a Benedictine Abbey and became a monk there. Next he was sent to Constantinople as papal nuncio. On his return he was chosen pope in 590AD., and his achievements in the fourteen years of his pontificate make him one of the most commanding figures in world history. First in importance was his mission to England, where he sent St. Augustine and forty of his Benedictines from the Caelian Hill monastery, this was important not only on account of the conversion of England itself, but also because of the spreading of the Benedictine Rule among the new races of Western Europe. He promoted likewise the conversion of the Lombards in Italy and of the Goths in Spain, upheld the rights of the Roman See against Constantinople, embellished the Liturgy in its sacramentary and in its chant, defended and befriended monarchism, and cared for the poor in Rome, at Ravenna and on his estates in Sicily. He was moreover a prolific writer, his dialogues, comprising the only extant life of St. Benedict, and his Regula Pastoralis are classics in ascetical literature. The "Holy Novitiate of the Cross" - What is it?